Blue Milk, is a Mockumentary Film directed by Rory Farmer (United Kingdom) is an official selection of the Austin Comedy Short Film Festival Fall 2018. This film also won the "Best Mockumentary Film Award." 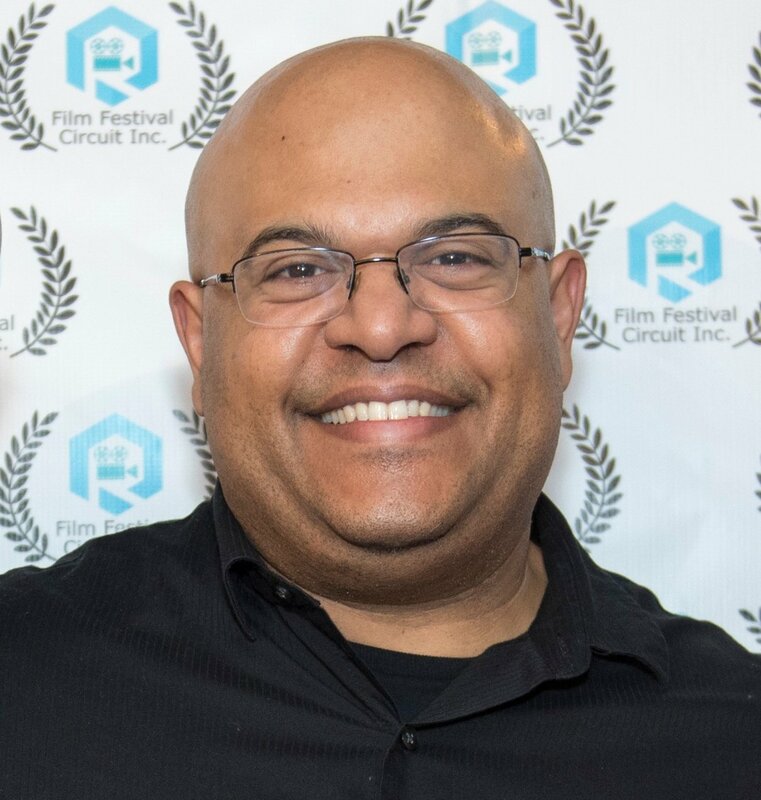 The Screening date was on Sunday September 16, 2018 at the Alamo Drafthouse Cinema Lakeline. 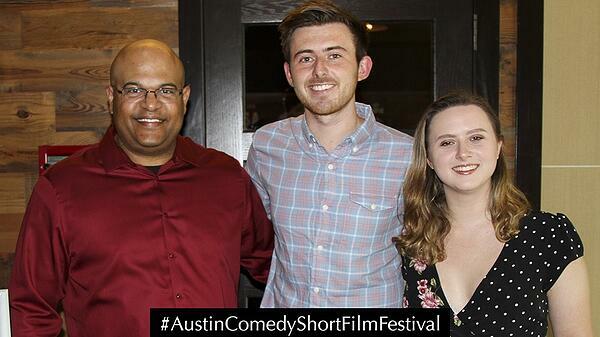 The Austin judges fell in love with this Mockumentary Film from the UK. Featuring an excellent performance from actor Byron Dean, Blue Milk put a fun spin on the Super Hero genre. 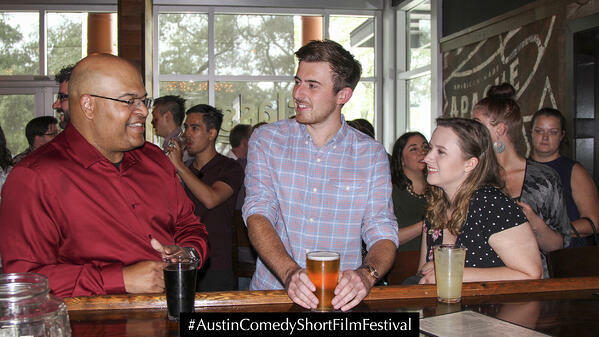 The Austin Comedy Short Film Festival audience connected well with the dry British humor and laughed out loud several times throughout this film. Especially the ending, which inspired a huge round of applause. Rory Farmer did a good job of showing the typical Superhero character arc with a comedic spin. The superhero, Blue Milk, acquires his strange super powers under strange circumstances, by drinking a strange Blue Milk mixture. As a result, he gained a super power that is virtually useless. Then in a freak accident and communication breakdown, manages to turn one of his allies into his arch nemesis. Blue Milk attempts to seek help controlling his superpowers, but a catastrophe occurs, which opens the doors for a sequel. This film features an original score by composer James Gair, which is well executed and intensifies the funniest scenes. Overall, a great effort by Rory Farmer and his crew. It was a pleasure, having them in Austin, Texas for their world premiere. We hope to see more films from Rory and company, in the future. "A camera crew follows the life of Joe, a travel agent struggling to control his mysterious newfound superpowers. He soon begins to realise that these abilities are for more hassle than they're worth, and when sacked from his day job he resorts to becoming a full time superhero." "Rory is a recent graduate of the MA Filmmaking programme at Bangor University. 'Blue Milk' represents his efforts for his MA thesis film and gave Rory his first opportunity to command a budget over a film and to exercise his creative capabilities with a full cast and crew at his disposal. 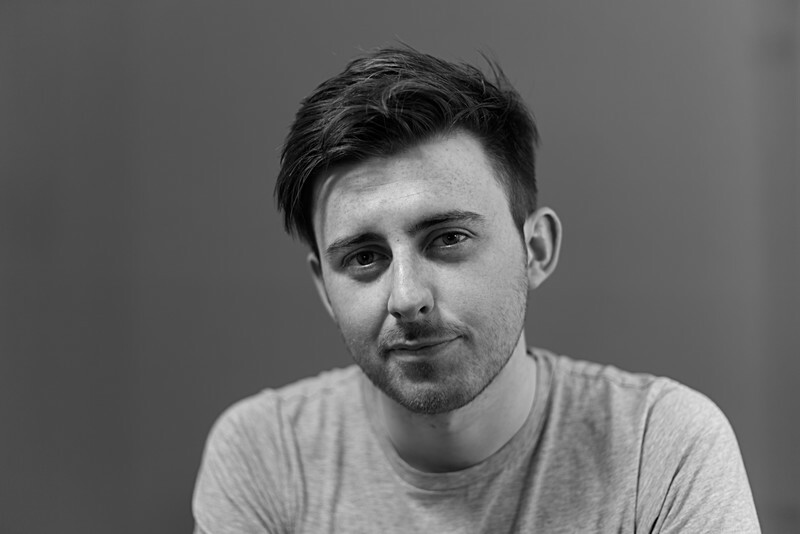 To date, Rory's main efforts have been self-made and self-shot including his micro-short comedy 'Storm in a Teacup' (2017) which featured at Fresh Student Media Festival 2017 and the Bangor Student Media Festival. But Rory has also ventured into documentary filmmaking with his efforts in 'Sofia's Eyes' being recognized in five festival outings in 2017. Rory is heavily influenced by director Edgar Wright (Hot Fuzz, Baby Driver) and attempts to bleed through a similar visual element to his own comedy. Other influences including Steve Coogan's 'Alan Partridge', Sacha Baron Cohen's 'Borat', Graham Lineham's 'The IT Crowd' and the works of David Mitchell and Robert Webb in 'Peep Show'. Blue Milk, for me was an opportunity to explore the them of identity & true friendships. 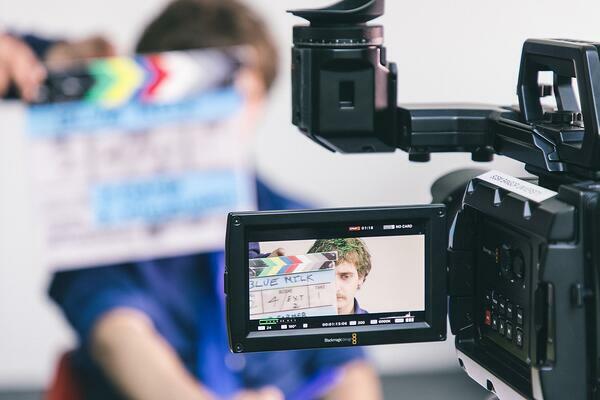 The idea came at a time when I'd just finished my undergraduate degree and I was stuck working in a bar, and I began to contemplate whether the dream of a filmmaker would ever come true. I'd spent three years striving towards it and it had just gone cold, so for me I'd hit a bit of an identity crisis. As it were the idea developed from an interesting customer I served in the bar, so I think all good things must come to those who wait. But I wanted to explore the notion that our identity is always in a state of flux, and that we're constantly adapting and changing as we grow older. 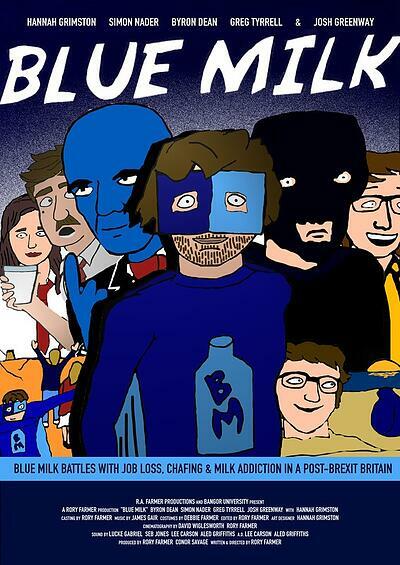 In 'Blue Milk', Joe has to face the challenge of coming to terms with his powers, losing his job and becoming a superhero so he goes through a massive upheaval in his life. I'd recently watched Taika Waititi's 'What We Do In The Shadows' and loved the idea of making this concept in the form of a faux-documentary, because I think what it allows is a sense of realism and a sense of intimacy with the character. I think the audience gets a real opportunity to begin to associate with Joe and to feel sorry for him as his plight becomes worse and worse. 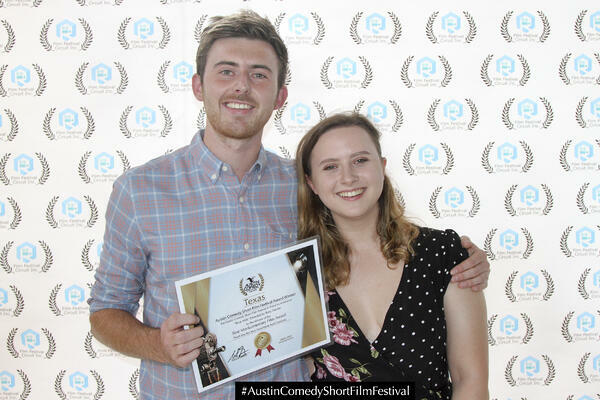 Congratulations "Blue Milk" Directed by Rory Farmer is an #AustinComedyShortFilmFestival Fall 2018 Official Selection! Safe travels from the United Kingdom, we are honored to have you in Austin, Texas for the screening of this hilarious Mockumentary Film.